Super Mario Galaxy is one of the most beloved Mario games of all time -- it came in at number 9 on our Top 50 Videogames of the Decade list -- but don’t tell that to New Super Mario Bros. Wii. According to NPD sales numbers, Galaxy has sold 4.1 million units in the two-plus years since its launch in November 2007. But by the end of 2009, NSMB Wii -- which had been out for all of 45 days at that point -- had already sold 4.2 million copies. Astounding, isn’t it? In fact, NSMB Wii topped the December 2009 sales charts by moving 2.82 million units, which even beat out the juggernaut that is Modern Warfare 2 by approximately 70,000 copies. So why is NSMB Wii selling like hotcakes when Galaxy has been a (comparatively) slow burn? Well, the install base is certainly a factor: at the end of 2007, there were just under 9 million Wiis in North American homes, and that number has gone up to 26 million since then (including 3.81 million in December 2009 alone). And I’m sure the retina-burning red box for the game helped it stick out from all the other white cases on store shelves. Plus, Nintendo marketed the hell out of NSMB Wii (and focused on its multiplayer lunacy, a big draw and a first for Mario games). Yes, all that stuff contributed to the game’s quick sales. But here’s what I think mattered the most. I think that as much as gamers clamor for originality and innovation in games, they’re actually way more comfortable with the familiar. Galaxy was lauded for breaking the mold with its spherical worlds and gravity-based gameplay, and 4.1 million sales is nothing to sneeze at, to be sure. But when Nintendo basically allowed you to play Super Mario World with three of your friends and gave the final product a ridiculous name, the game sold more copies in a fraction of the time. Nintendo has been selling you your childhood for the past two decades, and you’ve been eating it up. 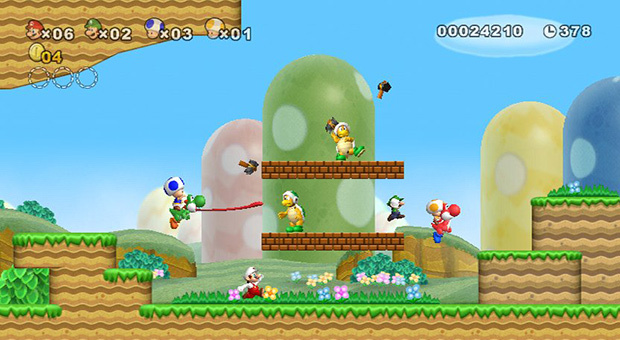 Maybe when Super Mario Galaxy 2 comes out later this year, it’ll feel familiar enough for you to buy it.